There are countless ways to create resists on fabric. Recently, I've been really hooked on the more geometric, specific shapes rather than the whimsical, random resists (which also have their time and place). Creating patterns with resist techniques help to create unique designs without having to print afterward. I completed this shibori design on a silk chiffon scarf. If you have never dyed silk before... oh.. my... gosh... it's magical! I mean... LOOK at this COLOR! (no filter, folks!) And yes, this color is from NATURE (madder root)! First, to create the pattern, you'll want to lightly trace triangles on each fold. For this scarf, I folded it in half in order to make a line of diamonds down the center of the scarf. You may decide to create even more folds to have more columns of diamonds. Either way, go for it! Experiment! You may want to measure how far apart your triangles are to get the most even pattern. After the triangles are traced, take thick upholstery thread and weave in and out of the fabric, following the traced lines. In the example below, I also traced triangles on the outer edges. Yes, I sewed the outer edges together. This will create the half diamond shape on the edges of the fabric. Important: LEAVE AT LEAST 5 INCHES OF THREAD ON EACH SIDE OF THE TRIANGLE- YOU'LL NEED IT LATER! Once you have all of your triangles stitched, pull the thread to gather the fabric. Once it's gathered, pull again to get an equal amount of thread on each side of the design. You'll then wrap the "nub" of fabric with the thread, as tightly and evenly as you can. This will prevent the dye from hitting that part of the fabric, and will create a white space. Any part left exposed will dye. I left the tip exposed so that my diamond would have a colored center. I decided I wanted even more resist than the thread would give, and so I used rubber bands to block out as much color as possible. Reminder: Soak your fiber (my suggestion: at LEAST 20 minutes, depending on the fiber) before adding it to the dye vat. I forgot to get a picture of it in the dye vat. I used about 2 tablespoons of ground madder root for this scarf. Also, I pre-mordanted the scarf in an alum prior to dyeing, which can help to brighten the colors. This color is so rich, my iPhone 5 had a difficult time processing the color accurately next to the white wall. No filter below! If you're a little bit behind on wrapping gifts, you're not alone. The one pictured above is the only gift I've wrapped so far! As an alternative to wrapping paper waste, consider furoshiki (textile wrapping) to package presents in a bit more of a sustainable way. It's super easy, looks really pretty, and can be reused from year to year from gift-giver to gift-receiver. Sidenote-if you don't have a playlist going yet, here's what I'm listening to today while wrapping presents. Here's to enjoying all our hours of every day! Merry Christmas! Thanksgiving Table Setting Dye Party! A while ago, we thought it would be fun to get a some of really great women together to create table settings, eat some delish food, and enjoy each other's company. So, last Friday morning, I loaded up the Vanagon with my extra dyepots and tons of miscellaneous supplies, and headed from Baltimore to Cleveland. Jess and I spent Friday afternoon enjoying being in the same city, scouring and mordanting the rest of the napkins, and hunting for loose onion skins in various produce aisles. We hit the jackpot at a college-staffed, crappy grocery store near Case Western University where I damn near got my entire arm stuck in a false-bottomed onion barrel. Nobody else in the produce aisle seemed to remotely care. We made a note of the bounty and headed back to Jess's house to finish soaking everything: red onion skins, yellow onion skins, madder root, avocado pits, Japanese maple leaves, sandalwood and logwood. Julia's Food: Pear tart, lentil tapenade, an assortment of truffles (not pictured), and delicious ginger-sweet potato soup (not pictured). Table runners dyed with indigo and acorns. Once everyone arrived, we explained the process and set them up on some shibori folding and stitching to create resist patterns for their table settings. Once everything was folded and thoroughly soaked, it was off to the dyepots! Everyone had great results and got to play around with different color combinations, mordants, and resist patterns. A successful day for some beautiful women! Thanks for being in our lives, ladies! We'll dye with ya'll any day. The complexity is not with the treatment of the fiber, but rather with the treatment of the vat. With most natural dyes, you simply extract the dye matter from the dye stuff through a water bath. With an indigo vat, it can get tricky making sure the pH balance is JUST RIGHT. And I really mean it. We have had our fair share of vat failures... but after we started using the following recipe, things started to look... well... a little bright bluer. There are many different types of indigo vats- some are as authentic as using urine... that's right, urine... to ferment the vat. I'm curious about that one, but haven't yet convinced myself or my husband that we need to start collecting our urine. There are also indigo recipes out there that use toxic chemicals, and we also (obviously) aren't interested in that. So we use Michel Garcia's recipe 1-2-3 Organic Indigo Vat. If you're ready to take the indigo challenge, click on the link above to follow the recipe. It's solid. Below are some troubleshooting tips I've provided to accompany the above recipe. Be creative and have fun! Pebbles found in my backyard used in the "Wetting out" process. Tip #1: IF YOU ARE USING A LARGE VESSEL, USE AT LEAST 4 OZ of INDIGO POWDER. In Michel Garcia's recipe, it first indicates to turn the indigo into a paste by adding just a little water and stirring it. This is called "wetting out" the indigo. TIP #2: USE MARBLES or STONES INTEAD OF STIRRING. Instead of stirring the indigo, I have found a lot of success with placing marbles or pebbles with the weighed powdered indigo in a little jar. Add some boiling water to the jar. Put the lid on and shake vigorously. The marbles will do a fantastic job at making sure that each individual indigo particle is "wetted out" properly. The mason jar used to "wet out" the indigo. There's about 4 oz. of indigo in there, along with 4 oz of water and a few pebbles from my backyard. This is after is was shaken. After wetting out the indigo, I transfer everything to a plastic picture. I also keep a kettle of almost-boiling water ready to add after each ingredient. I pour in my jar of indigo and rinse the jar with the hot water into the plastic container. After adding the fructose, really make sure that everything is dissolved. I usually add a bit more water 9about 1/2 full. TIP #2: AVOID OXYGENATION OF THE VAT. SLOWLY add the calcium hydroxide. Try to avoid introducing ANY OXYGEN into the vat from here on out. Oxygen will eventually throw the balance off and your vat will no longer work. This means stir slowly and add new water in a way that creates the LEAST amount of air bubbles. Dye Vat, Plastic bucket filled with water for rinsing, drying rack- all completely necessary for the dye space. THE actual WATER should be brownish/yellow. The "flowers" on top should be bright blue. Tip #4: WORK IT! Work your fiber in the dye vat, especially if you are dying a large piece of fabric. Instead of placing it in the vat and walking away, I like to gently massage the fiber, keeping it from touching the bottom of the vat as well as keeping it completely submerged under water. Tip #5: AFER-RINSE. After dyeing, oxygenate your fabric in water. Some people just hang the fiber right out of the dye vat, but i like to oxygenate the fiber in a bucket of water. 1. It collects the extra indigo that we can reuse later, and 2)the fiber tends to turn out more evenly dyed. 3) It creates space on the fiber for future dips. Rinsing out the recently dyed fiber in a bucket of water. Notice how the fiber is still a bright green after pulling it out of the vat- this is because it hasn't fully oxygenated yet. If your fiber is blue when you take it from the vat, the pigment will wash right out. Tip #6: REPEAT DIPS. Usually to get a deeper blue, you'll need to repeat these steps 4-8 times. Let the fiber rest at least 5-10 minutes between dips. Wash with a ph neutral soap until water runs clear. Hang to dry! Dandelions--they make the gardener wince and the hippie dance. We think they're pretty cool. All parts of the overly-plentiful plant are edible, drinkable and they're a staple of childhood memories filled with wishes, crowns, and some kid rhyming thing I vaguely remember where you use your friend's arm as a slide and pretend the dandelion is a kid who slides down the slide and pees the whole way down, leaving a yellow mark smeared on your arm (anyone else?!) I recently stumbled upon a natural dye website that stated that their roots can be used to make a magenta color on wool when mordanted with alum. After doing some research, it seemed like this color was pretty elusive to many (everybody, in fact, but one source I could find), but I wanted to test it out. As cool as they are, them dandelion roots are DEEP and a pain to get out. Block off a few hours if you want to try it for yourself! I couldn't find a recipe for the roots, so I prepped them in several ways. Way #1: Soaked the roots for about 5 hours, chopped them up, and simmered them for 4 hours. This way produced absolutely no color on mordanted wool. Don't try it. Way #2: Soaked the roots for about 4 days and turned often to prevent mold from building up (it. smelled. gross. ), rinsed them, blended them in my blender (would never do this normally, but since dandelion roots are edible, I didn't see the harm) and then simmered them for about 5 hours. The pulpy water was a more convincing dye color than in my first try. I let it cool, kept my wool at approximately the same temperature, added it to the dye bath, and slowly turned the heat back up so as to not felt the wool. After simmering for about an hour and then leaving to cool for about 5, the color produced a subtle, light tan. Definitely not magenta. I used equal parts WOG to dye stuff. Way #3- Still in process: I'm drying the roots for several months (following madder root recipes). In a few months, I'll soak them for 24 hours or so, blend them, and heat them for the dye bath. I had a ton of dandelion flowers left over after digging up all those roots, so I threw them into the pot at 75% WOG to dyestuff. I simmered them for about 2 hours, strained them out, let the dye bath cool a little, and in went the wool. I Got a bright, bright yellow color on my alum-mordanted wool. I don't really need more yellow wool, but it is pretty (and prevalent! I could dye curtains for my entire house!) I also had some silk ribbon (mordanted in aluminum sulfate as well) that I threw into the dye bath too. It came out a softer yellow color, possibly because of the natural color of the silk--a light tan. Note- if you hold the secret to the mysterious magenta-dandelion-root-dye-bath-color, please comment! Thanks to DavenportGroves for the wool! Once again, we were lucky enough to spend an afternoon with some really beautiful, artful people! We partnered with Rebecca from A Daily Gathering and her awesome interns, Becca and Anna, to create some crazy colors and partake in some delicious bites and sips in an historic barn in Purcellville, Virginia. When we first talked about holding an outside event at the end of March, we knew rain was a possibility, but somehow we didn't consider the cold...Maybe it was just wishful, winter-thinking! On Saturday, the thermometers read thirty degrees and windy... but 15 women zipped up their winter coats, donned their scarves and hats, and joined us for 4 hours out in the cold to see what beautiful colors nature yields. Prior to the event, Sarah and I scoured 5 different types of fibers and Using 3 different mordanting treatments in order to achieve the most diverse color palette- it was totally worth the effort! Our dye vats were steaming with acorns, avocado pits, red onion, yellow onion, madder root, and logwood. We recorded our work by styling a swatch book with over 30 different colors - the results were absolutely stunning! We finished the session by creating shibori resists on tea towels. We hung them to dry, but it was so cold that they ended up freezing on the line! Even with the freezing temperatures, I couldn't imagine a more enjoyable afternoon! Thanks to Rebecca and her crew for such a beautifully styled event with such tasty food, and to our host, Emerald Hill Farm, for stoking the bonfire- we were able to keep warm inside and out! Also, thanks to Silk and Willow and Davenport Groves for donating the natural fibers. Photos by Anna Clair Photography. Dining and Dyeing--- Recap of Roots and Leaves with MakeTribe last month! Natural dyes, crafty folks, locally-sourced food and libations, and a beautiful venue....boom. mic drop. Last month when the American Craft Council was in town for their annual show, we had the pleasure of partnering with a bunch of Baltimore local businesses to put on a natural dye workshop for members of the ACC and other interested, lovely people, organized by the talented Jess of Make Tribe. It is so inspiring to meet so many talented people with similar passions, and it's got me so excited for our workshop this weekend with A Daily Gathering and for what's in store for the rest of the year! And so... come crush a cup with us at the grand opening of The Redeux Marketplace on Friday, June 20 at 5:00. We are calling it a catered Vintage Shopping Happy Hour, complete with beer tasting! How could you go wrong? To keep an accurate archive of our work after changing sites, this post has been copied from our original post at sewdowngoods.com from June 13, 2014. To find the original blog, click here. May. I don't think I really sat down at all. Or took a nap. Or was bored. After working our full-time jobs, and Sarah working her second job, we got together in our "free" moments and made things. We destressed by experimenting with some new dyestuff, sewing pillows, embroidering and reupholstering. Our hard work paid off, and I can say that we are very proud of the end product. With a little bit of help and a lot of support from our guys, we officially set up shop in the Redeux Marketplace in York, PA! To keep an accurate archive of our work after changing sites, this post has been copied from our original post at sewdowngoods.com from April 6, 2014. To find the original blog, click here. Naturally-dying fabric in the winter is challenging. (Wait, shouldn’t winter be over by now??) Our dye garden hasn’t yet sprouted, and foraging is limited. We turned to our compost for some ideas. Thankfully, due to our love of cooking, we go through a lot of onions. I mean A LOT. Too bad A LOT of onions still isn’t enough to dye yards of fabric. Our friend Dave Dietz, a local organic farmer, saved some skins for us, and we added those to our onion skin stash. We were able dye about 5 pounds of various materials, using both red and yellow onion skins. I actually used cold mordanting for this batch- it seems to have worked better than the warm mordanting for the larger piece fabrics, and much less time involved! I had an old indigo vat going too, so I overdyed the left onion skein with indigo. Left to right- indigo overdyed yellow onion wool, red onion with no mordant on wool, red onion with alum mordant on wool, red onion with alum mordant on cotton-linen blend, yellow onion with alum mordant on wool, 2 yards heavyweight organic linen, tannin-alum-alum mordant with yellow onion, and then the napkins are all organic linen. Top to bottom- red onion no mordant, yellow onion overdyed with red onion alum mordant, yellow onion no mordant, red onion iron mordant, red onion alum mordant, yellow onion overdyed with indigo alum mordant and iron mordant. I also decided to reduce the rest of the 5 gallons of red onion bath down to a single jar by simmering for a couple of hours. This way, I'll have a concentrate that I can either reduce down further to block print, or we can reconstitute it in another 4 gallons of water to use at a later date. To keep an accurate archive of our work after changing sites, this post has been copied from our original post at sewdowngoods.com from November 27, 2013. To find the original blog, click here. You can't make old friends. But you can make old friends birthday presents! And since making surprise furniture for friends can be an awkward gift, we decided to go a different route. The japanese maple tree in Sarah's backyard is such a brilliant maroon color that we just had to gather armfuls of leaves, chop 'em up, and create a dye bath for two pieces of slightly textured organic cotton. Sewed her up, and voila! This blanket is on her way to Cleveland (along with our hearts). Happy birthday! We love you, Liz! To keep an accurate archive of our work after changing sites, this post has been copied from our original post at sewdowngoods.com from October 28, 2013. To find the original blog, click here. It's fall, which means pumpkin beer, bonfires, and cold-weather beach trips...and... of course... foraging for natural dyestuffs? We have only done small-scale, kitchen-size hand-dyeing before, just because we didn't have a large enough dye vat to cook 5 yards of fabric. However, we were able to score a 100 quart stainless steel cook pot, and Mike welded a grate for our fire pit, so we set up an outdoor cooksite. 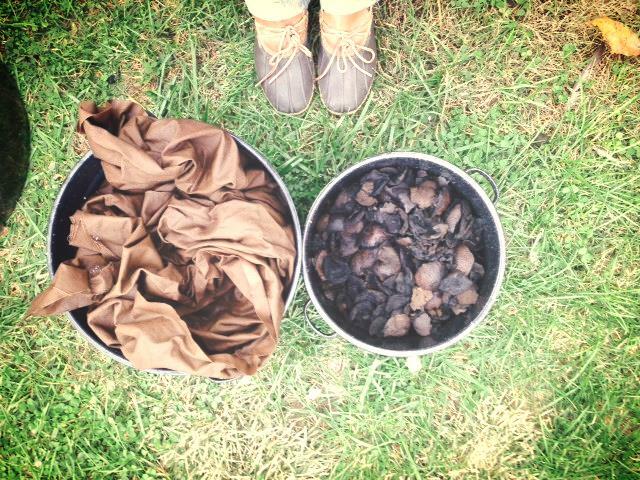 On the menu: pokeberries (small batch), and black walnut hulls (large vat). walnut before mordanting with iron. I think next time we'll keep half unmordanted- i really liked this camel color.